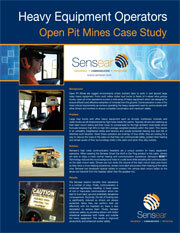 Open Pit Mines are rugged environments where workers have to work in and around large noisy heavy equipment. Large haul trucks and other heavy equipment such as shovels, bulldozers, bobcats and water trucks are all characterized by high noise inside the cabins. Sensear’s SENS™ Technology reduces the loud background noise thus enhances safety by providing drivers with better situational awareness both inside and outside the heavy equipment, while protecting hearing at the same time. This results in improved productivity and enhanced worker safety. How do you solve both without restricting either? Fill out the form on the right to download this case study to learn more. Copyright © 2006 - 2016 Sensear Pty Ltd.